As much as I complain about certain aspects of living in Prince George (like the shopping), there are things that are absolutely incredible. For one, we have a ton of neighborhood parks and urban forests. In fact, there are two small neighborhood parks within walking distance of my house. Once the weather warms up and the snow melts away, Prince George can be an outdoor paradise. We’ve had some beautiful weather here, so I finally got brave and joined a friend for some toddler play at a neighborhood park. I have to tell you, it was the perfect day for toddler play and a little grown up conversation. I loaded Norton up in the stroller and put Eudora in the Moby wrap. This way I didn’t have to fool around with jump seats, car seat mounts, or anything else. Besides, the entrance to the park is too narrow for any stroller, so this way I had an easy way to keep Eudora attached and still be able to chase after Norton. Once Norton was liberated from his stroller, he was delighted. It had been a long time since we’d been to the park and he’d just been turned loose to roam. (It’s a small fenced in park, only around an acre.) For a while, he was content to just wander around the open space. It was the first time in quite some time that we’d been outdoors and he got to play without me hovering. 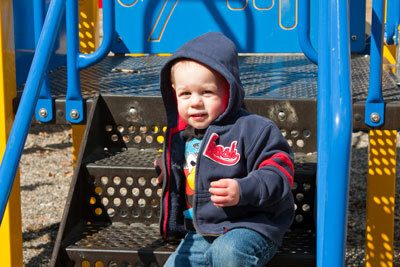 Then he moved into the playground area. At first, he was happy to just throw the gravel. 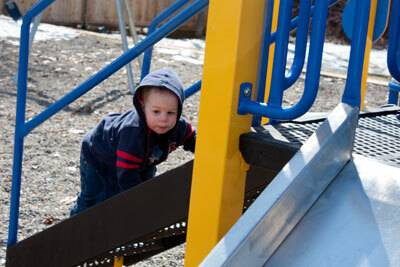 After we ate lunch, though, he got brave and started climbing the structure and actually going down the slide himself. Last summer when we went to that park, I went down the little slide with him. He cried. But this time, the slide was an amazing fun thing that he enjoyed all by himself. Not only did he find the perfect slide for toddler play; there were also a couple of spinning steering wheel type things that he greatly enjoyed. When it was time to go, I worried that we’d have a tantrum or some other form of unpleasantness as Norton has had trouble transitioning from one thing to the next when it’s not in the scope of his normal routine. Our friends were ready to go, so I told Norton that he had five more minutes. It turned out that I didn’t actually need to do that; when our friends started to leave, Norton was ready to go. On top of Norton having a wonderful time at the park, I also had the best and most productive day I’d had since we became a family of four.